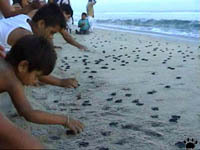 In November 2003, I had a chance to participate in a conservation effort aimed at increasing the numbers of endangered sea turtles in Oaxaca, the most biologically diverse state of Mexico. Tortuguero, Costa Rica. 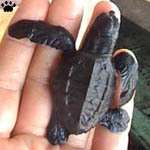 Of the five sea turtle species occurring in Oaxaca, two breed in the fall: small olive (also called Pacific) ridley and leatherback turtle, the World's largest (more than 3 m/10' long, and weighing up to one ton). 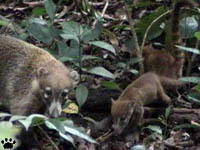 Family of white-nosed coatis (Nasua narica), La Venta, Mexico. Tikal, Guatemala. Sea turtle populations worldwide continue to decline because of poaching, resort development, and ocean pollution. 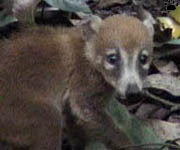 In Mexico, many nests are destroyed by feral dogs, coyotes, foxes, raccoons, and other predators. on a beach, Lost Coast, California. 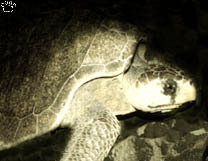 Olive ridley, Monterrico, Guatemala. 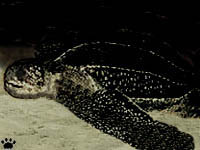 To escape predation, leatherbacks lay eggs very deep. Ridleys have another strategy, the so-called arribadas: at certain nights, hundreds lay eggs together on a few beaches, so that all predators can eat only a small fraction. But now ridleys are too rare for it to work. 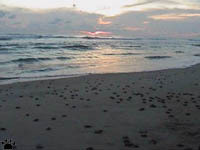 Ridley tracks, Playa Escobilla, Oaxaca. Playa Escobilla, Oaxaca. 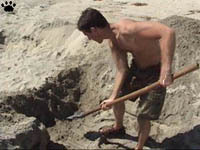 To increase the turtles' chances of survival, their nests are dug up It is easy to dig up shallow nests of ridley turtles, but it takes a lot of work to get to a leatherback's eggs, sometimes laid 1 m/3' deep. nest and the turtle that made it). Playa Escobilla. Eggs of olive ridley, Playa Escobilla. Each nest contains 30-60 eggs, but the ones on top usually have no yokes and can't develop. They serve as a distraction, sometimes letting predators fill up and leave instead of consuming fertile eggs below. 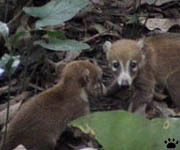 Baby ridleys, Playa Escobilla, Mexico. Eggs of olive ridley, Playa Escobilla. 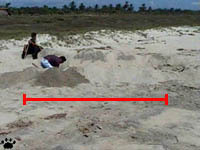 Eggs are incubated in moist sand for about a month. 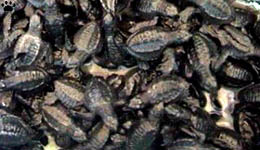 Hatchlings are soft to touch, but they are ready to be released almost immediately. 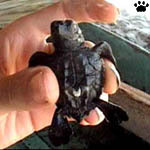 hatchlings are sometimes released on a single day. Releasing baby turtles is the best part of the work. At Playa Escobilla, olive ridley's main breeding site, they are turned into public holidays, with lots of people attending them each Saturday evening. land and seas than their parents and grandparents. Baby turtles heading for the ocean.